You can certainly find a lot of chatter about depression and celiac disease associated with gluten sensitivity in many online chat rooms, blogs and forums. If you read through a lot of these posts many patients say the symptoms of depression greatly diminished or even subsided when they stopped consuming gluten. When the patient reintroduces gluten back into the diet the symptoms of depression usually are quick to follow. From personal experience I can vouch for the link between gluten and depression. Although my daily work consists of educating people about a gluten free diet through my writings, I also admit freely that sometimes I falter and “cheat” on my gluten free diet. It does not happen that often, but when I do fall into temptation and eat the enemy gluten within a couple of hours I feel absolutely foggy and depressed. I wake up the next morning feeling depressed as well and it takes me about 2 or 3 days of being strict on my gluten free diet to feel “normal” again and not depressed. Bottom line: Try not to cheat on your gluten free diet- its not worth it. What’s the link between gluten and depression? For quite some time, there has been evidence linking depression to gluten along with other disorders like schizophrenia. 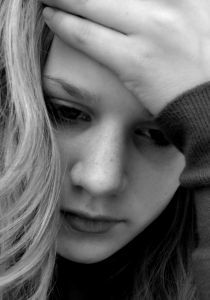 Clinical depression is linked with low serotonin levels in the brain. Serotonin is naturally made by our bodies. Many people today are on drugs like Prozac, Paxil, Zoloft, etc. to raise these levels if they are low in our brain and our contributing to our depression. Along with taking these drugs comes with some side effects too. Be sure to carefully discuss with your doctor before deciding together to take these drugs. In my opinion many doctors are just to quick to write a prescription for depression rather than take the time to review the patients diet. Did you know that 90% of the production of serotonin occurs in the digestive tract? Doesn’t it make sense that your food may just have an effect on serotonin levels in your brain? Gluten free diets, gluten free casein free diets and gluten free dairy free diets have been used for acne, ADHD, fibromyalgia, cronic fatigue syndrome, rheumatoid arthritis, autism, depression and schizophrenia, with some success. Even though the correlation is not 100% clear there is a scientific basis for a connection between gluten and depression in certain individuals. Only time will tell and future research may bring us a cure. The best decision for now would be to eliminate gluten from the diet as long as your doctor approves your decision.